hired Second City Trolley for my birthday this past Saturday night. The trolley picked us up at 9 PM sharp and our driver, Ali, was the best. He helped us pick out places to stop, set up the music, and was an all around very nice guy. Myself and 31 of my friends all agreed that it was one of the best nights we had ever had in Chicago and we starting planning out the next time we would arrange for another trolley. We stopped at Wrigley Field, Buckingham Fountains, the Museum Campus, and the Bean. All stops were perfect and I highly recommend the same route! Thanks Second City Trolley! . We offer the most special trolley experience in the Chicago area. Bridal Parties and Bar Hopping parties both love our beautiful custom interiors! Brides love our classic styling and antique couches, while Pub Crawlers enjoy our friendly, professional drivers and open seating that encourages greater socializing. All of the guests on our trolleys enjoy the atmosphere created by our iPod stereo hookups, fully air conditioned and heated vehicles, some trolleys with open decks and balconies giving you the best views of our beautiful city and skyline.We have the trolleys with the most character and soul! Travel to the chapel in style aboard an elegantly styled wedding trolley adding a unique charm to your special day. 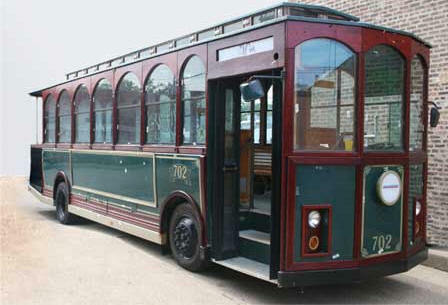 The trolley evokes a bygone era while providing reliable group transportation. 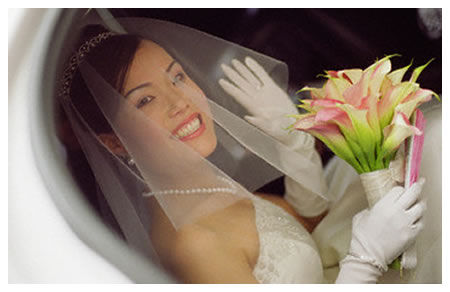 The entire bridal party can ride together making your arrival to the chapel, photos and reception even more memorable. 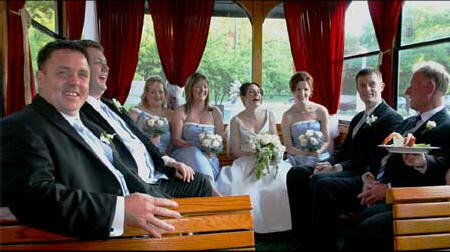 The trolley is perfect for candid wedding group pictures. You may have family and friends arriving from all over the state, or even the country, many of these people may be unfamiliar with the area; so let us be your designated driver, helping your family and friends get to the wedding ceremony and back safely to the hotel after the reception. 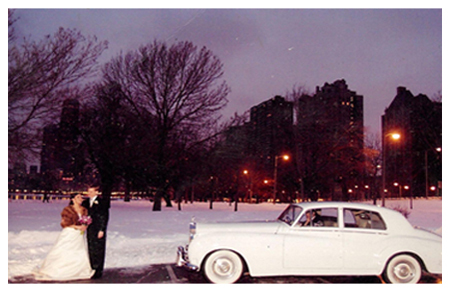 Second City Trolley Rentals offers Saturday wedding packages. Wedding Packages. Please click on the links below for further description. Can be purchased after your initial package time. After our 4 hour package, you can purchase 1 hour of service at the rate of $250.00 per hour. After 4 hours of service, more time can be added in ½ hour increments of $125.00 per ½ hour. The location fee is based on the distance the trolley has to travel between our base of operations, Chicago, and the most distant location of your event (and our return to Chicago). Not all locations have a fee. The fee covers our traveling costs and surcharges. The price does vary depending upon the location of your event. Your clock yelp4ts when we arrive at your initial location. NON-REFUNDABLE Deposit to Reserve Vehicle: 30% or $260 (whichever is greater) reservation deposit on a Master Card, Visa or American Express will guarantee your wedding date. Summer dates sell out fast. Plan ahead and reserve your white Rolls Royce or trolley for your wedding day. It is appreciative and customary, the day of event, to pay the driver a gratuity if you are pleased with their services.